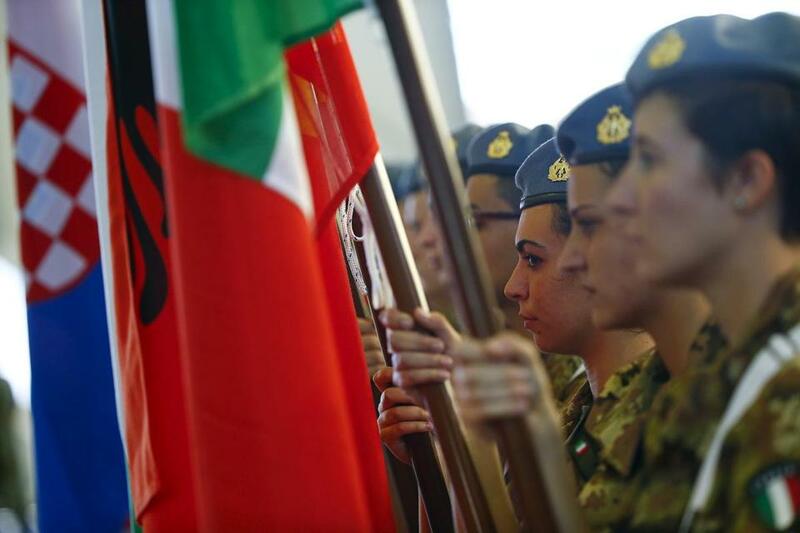 Italian soldiers held flags during a NATO military exercise in Trapani, Italy, earlier this month. Russian President Vladimir Putin’s military aggression used to be confined to unlucky former Soviet states that Putin hopes to transform into “Greater Russia.” But increasingly, Putin is venturing farther afield. Not only has he greatly expanded Russia’s military role in Syria, but earlier this year he struck a deal with Cyprus that allows Russia’s Black Sea Fleet to dock there. And last week, the Russian government announced plans to build a military base on the Kuril islands, on disputed territory seized from Japan at the end of World War II. Russia’s military posture makes the NATO alliance between the United States, Canada, and Western Europe more crucial than at any time since the end of the Cold War. The 1949 North Atlantic Treaty, which states that “an armed attack against one” shall be considered an attack against all, is the single most powerful deterrence to Russian aggression in Europe. Yet Europeans seem to have forgotten the importance of this alliance. According to a recent poll by the Pew Research Center, only 38 percent of Germans and only 40 percent of Italians think their country ought to respond militarily if Russia attacks a fellow NATO ally. The numbers were slightly higher in France, Spain, and the Britain – 47 percent, 48 percent, and 49 percent, respectively. That means less than half of the public in those countries believe in the notion of collective defense. Last week, Anders Rasmussen, former NATO Secretary General, called the poll “extremely disturbing news.” Lucky for Europe, a majority of Americans – 56 percent — support the idea of defending a NATO ally. These attitudes translate into defense budgets. Although NATO guidelines direct member states to spend at least 2 percent of their Gross Domestic Product on defense, only five of 28 members actually do: the United States, Britain, Greece, Estonia, and Poland. Indeed, the United States spends 3.6 percent. Meanwhile, Germany spends a mere 1.2 percent. Italy, Canada, and Spain spend 1 percent or less. It’s understandable that people in those countries prefer to spend their money on universal health care and paid parental leave. But one of the reasons they’re able to do that and skimp on defense is the security subsidy they get from US taxpayers. The United States foots the bill for 73 percent of NATO’s defense spending, including the cost of keeping more than 40,000 troops in Germany. The fact that so many Europeans have come to take US protection for granted could be seen as a sign of the trust they place in the US-led NATO alliance. But a truly strong alliance requires equal participation from all members. Europeans can’t expect Americans to make sacrifices to defend them if they aren’t willing to make the same sacrifices to defend themselves.